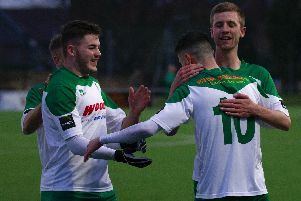 Sids qualified for the first round proper of the FA Vase with a terrific display of team spirit, gutsy defending and superb counter-attacking football. The home side had the majority of play in the early stages as they pushed forward but the Sids defence held firm and kept their fourth clean sheet in a row, restricting Wood to long-range efforts – and when the defence was breached Matt Boulton in the Sids goal swept up magnificently. The only real scare came from a corner which fell kindly to a Wood forward – he smashed the ball against the post and it rebounded to safety. At the other end Sids were dangerous on the break with Cameron Corell and Morgan Forry forcing fine saves from the home keeper. From a resulting corner Jordan Lillywhite seemed destined to score only for the keeper to tip the ball away. The second half was a mirror image as Wood piled on the pressure but again Sids defence were resilient with Howard Low in imperious form. Another breakaway earned Sids the winning goal. A pinpoint cross from Forry was met by the head of Ben Mepham and he placed his header across the helpless keeper. Sids should have made the game safe soon after when Forry was released by Dan Martin’s pass but Forry shot straight at the keeper. The home side pushed on looking for the equaliser. Their best chance came deep in injury time, and the exhausted Sids could only watch on as a Wood forward burst through one on one with Boulton. His shot was smothered by the onrushing Sids keeper to clinch the tie. Sids will host Chstham in the first round while Pagham will visit Hanworthy Villa. Sids: Boulton, Dines, Low, Madden, Lillywhite, Corell, Chittock, Martin (Smith), Forry (Dean), Mepham (Lynch), Kilhams. Selsey manager Daren Pearce admitted his side made two mistakes which cost them a place in the FA Vase. (See some pictures from the game in the slideshow, above). His side lost 2-0 at home to Bearsted but Pearce was pleased with the overall performance of his players. Bearsted beat Chi City earlier this season in the FA Cup, so the hosts knew it would be a tough game from the start. Selsey went a goal down within the first two minutes. The visitors then doubled their lead in the 14th minute. The hosts were creating chances and defended well but couldn’t get back into the game. Pearce said: “I was a tad disappointed because we set up nice and compact, but we made two silly mistakes which cost us two goals. When you make mistakes, you get punished, and we made two mistakes which we haven’t made in previous games and they took full advantage of it. On Saturday Selsey host Hailsham Town, who are second in the SCFL division one and are unbeaten in the league. Selsey: C Kelly, Atkinson, T Kelly, Hambleton, Higgins-Pearce, Britton, Mockford-Allott, Buckland, Gregory, Jefkins, Morey. Subs: Bush, Hall, Harvey. * Midhurst are through to round three of the RUR Cup after easing to a 3-0 win over Arundel at the Rotherfield. Jake Goulding scored twice in the opening half-hour and Matthew Brown soon added a third. (See some pictures from the game in the slideshow, above). Midhurst host Seaford in SCFL division one this Saturday. A double from Jermaine Beer finally enabled Cowfold to avenge their late-season defeat to the Reds as the new campaign continued to be tough for the hosts. Bosham are under caretaker managers Tony Hancock and Danny Mullen after Dennis Hughes resigned and it was the Blues who started well – and Bosham needed to be on their guard to stop the visitors from grabbing an early lead. Ben Blanshard and Ian Reddington did their bit with shuddering tackles and firm headers. The Reds began to find their feet with new signing Conor Crabb looking sharp and Alex Barnes always a terror with his pace. Twenty minutes in, Harley Redman pulled off a stunning save for the Reds when Beer seemed certain to score. His volley was brilliantly saved from close range – but a couple of minutes later, he could do nothing to prevent the visitors from breaking the deadlock. Modu Sarr swung in a corner and Tim Martin got his head to the ball to put the Blues 1-0 up. Bosham regrouped and Luke Gregory had a couple of opportunities but an offside flag ruled out a sublime finish from the striker on the half-hour. Close to the interval the Blues doubled their lead as Greg Brabon headed home a teasing cross from Tom Easton. Bosham almost got back into it but Blanshard was denied goal from a point-blank header from a corner that saw keeper Joe Groome make a superb save. They further tested Groomeand with time running out, their exertions forward saw them caught on the counter when Beer netted. Minutes later Will Lewis showed what a quality player he is by twisting and turning in the box before firing low past Groome to give the Reds hope. But Cowfold surged forward again and Beer made it four in the 90th minute from the spot to end the contest. This week Bosham make the long trip to Westfield. Bosham: Redman, Metherell, Hiscock, Blanshard, Reddington, Spicer, Barnes, Lewis, Gregory, Crabb, Terry. Subs: Desi, Lidster, Penton.